The 34.3-cm (13.5-in.) 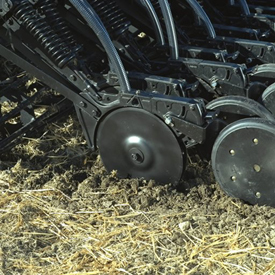 diameter double-disk openers are offset to create a narrow furrow for optimal seed placement. They feature aluminum boots and have a long-arm/short-arm stagger for residue clearance. Either 15.2-cm (6-in.) or 19-cm (7.5-in.) 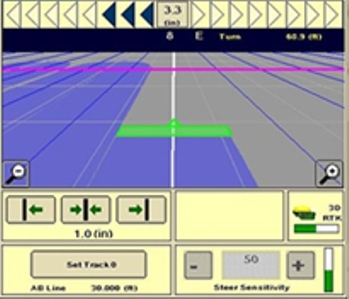 row spacing is available. NOTE: 15.2-cm (6-in.) spacing is not recommended for heavy, sticky soils such as the Red River Valley of the North. NOTE: 15.2-cm (6-in.) row spacing is not recommended for high-residue conditions or sticky soils like in the Red River Valley of the North. 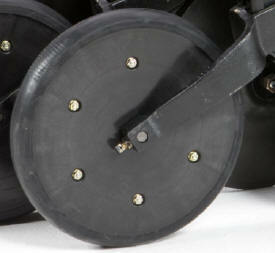 The 730 Level-Lift Air Disk Drill frame is very similar to the 2210 Level-Lift Field Cultivator. 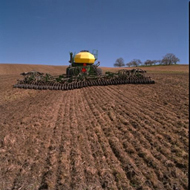 The 730 LL Air Disk Drill is a secondary tillage and seeding tool, an industry exclusive from John Deere. This frame is designed to offer durable support for the double disk openers while providing flexibility over level to gently rolling terrain. The TruPosition™ shanks have a trip force at 90.7 kg (200 lb) and a 25.4-cm (10-in.) trip height.